Restaurant and Cafe Pro is a clean and feature-rich premium WordPress theme crafted for businesses that provide food services. 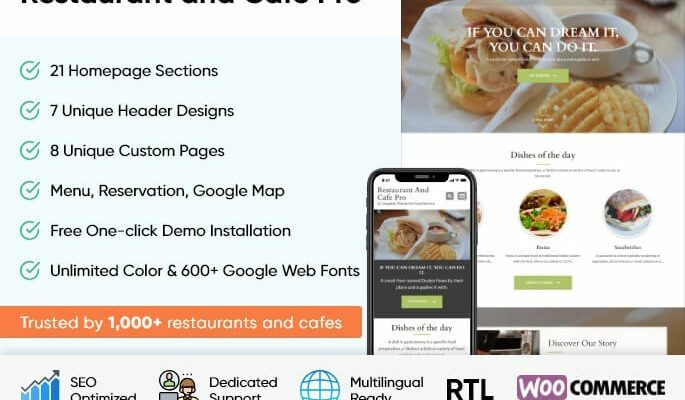 This easy-to-use WordPress template will help you create your restaurant, cafe, bakery, cafeteria, or catering service website without writing a single line of code. You can easily showcase your services, food-menu, specialties, gallery and many other features of your business with this SEO optimized, mobile friendly, and speed optimized WordPress theme.